The 2019 Dodge Durango offers plenty of muscle packed into an SUV. Featuring high-performance engines and smooth handling, the 2019 model year brings a perfect blend of performance, refinement, and fuel efficiency. Amidst an already impressive lineup, the 2019 Dodge Durango GT models now share the same performance front fascia and LED fog lamps found on the Durango SRT and R/T’s. Let’s see what else consumers can look forward to. The 2019 Dodge Durango is the ultimate high-performance SUV. The 2019 model year provides five unique trim levels – SXT, GT, Citadel, R/T, and SRT. Each trim level offers a variety of luxury features and certainly no shortage of convenience for any potential Durango consumer. The base SXT, GT, and Citadel models come standard with a 3.6-liter Pentastar V6 engine. Paired with a TorqueFlite eight-speed automatic transmission, the Pentastar V6 engine produces 295 horsepower and 260 lb-ft of torque. Once equipped with TorqueFlite transmission, each model has a best-in-class towing capacity of 6,200 pounds. 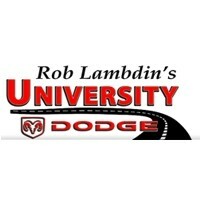 Standard on the Dodge Durango R/T model and optional on the Citadel trim is the 5.7-liter HEMI V8 engine. Once paired to the TorqueFlite eight-speed automatic transmission, the HEMI V8 engine outputs 360 horsepower and 390 lb-ft of torque. Also, the 5.7-liter engine includes a Fuel Saver Technology with cylinder deactivation alternates between smooth, high-fuel economy four-cylinder mode and V8 mode when more power is needed. Equipped on the 2019 Dodge Durango SRT, the standard 6.4-liter HEMI V8 engine is the reason why the SRT continues to be “America’s fastest, most powerful and most capable three-row SUV.” The 392-cubic-inch HEMI V8 delivers 475 horsepower and 470 lb-ft of torque, allowing the SRT to go from 0-60 mph in 4.4 seconds and covers a quarter-mile in 12.9 seconds – certified by the National Hot Rod Association (NHRA). Lastly, the Durango SRT has a best-in-class towing capacity of 8,700 pounds. For the 2019 model year, the Dodge Durango continues to offer a bold-styled interior cabin. One of the biggest changes for 2019 is the addition of SRT styling on the GT trim level. Standard interior features on the Durango SXT includes leather seating, perforated leather-wrapped sport steering wheel, and a driver-oriented electronic T-shifter. Additionally, for an added premium feel, the SXT has five-passenger seating that includes 50 different configurations. The Durango GT trim comes standard with capri leather-trimmed seven-passenger seating. Optional features include heated first- and second-row seats plus a power liftgate. The Durango Citadel and R/T models feature standard second-row captain’s chairs. The Durango SRT delivers a premium and luxurious interior cabin that includes laguna leather, true carbon fiber accents on the instrument panel, door bezels paired with a hand-wrapped dashboard with live silver accent stitch, and SRT flat-bottom performance steering wheel with standard paddle shifters. Heated and ventilated front and heated second-row captain’s chairs with embossed SRT logos are available, along with floor mats also embroidered with SRT logos and a suede-wrapped headliner for a premium and refined feel. 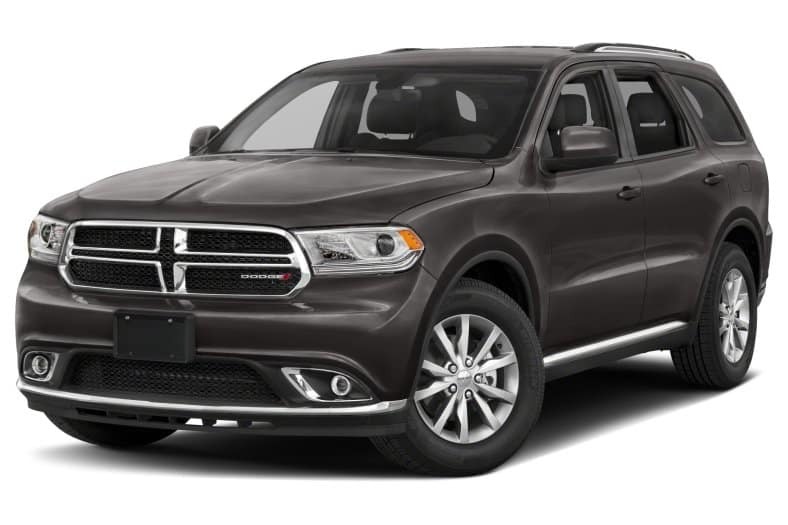 The 2019 Dodge Durango features a muscular and toned look which sets it apart from any other crossover SUV on the market. As previously mentioned, the Durango GT models now share the standard performance front fascia and LED fog lamps with R/T and SRT models. An SRT-inspired performance hood with a center air inlet duct and two heat extractors are optional. Moreover and new for 2019, the GT models offer a new 20-inch wheel design in a satin carbon or brass monkey finish. The Durango Citadel and R/T models come standard with 20-inch polished aluminum wheels, HID headlamps with automatic high-beam headlamps. The Durango SRT features high-performance Brembo brakes with two-piece rotors, and optional 20-inch wheels with satin carbon, matte vapor or brass monkey finish. Lastly, an Active Damping System that opens and closes the SRT’s suspension damper valve and an exhaust system delivers an undeniable deep, high-performance Dodge//SRT exhaust note. The 2019 Dodge Durango offers just about any entertainment feature that fits any budget. The Durango SXT model features a customizable 7-inch touchscreen powered by Uconnect 4 with Apple CarPlay and Android Auto capabilities. The Dodge Durango GT, Citadel, R/T, and SRT models include a Uconnect 4C NAV with an 8.4-inch touchscreen, navigation, and Apple CarPlay and Android Auto compatibility. Optional entertainment features include 825-watt, 19-speaker Harman Kardon audio system that delivers premium sound and refinement. There are numerous safety features included in the 2019 Dodge Durango. Advanced multistage front airbags, stability and traction control, ParkView rear backup camera, Sentry Key theft deterrent system, and remote proximity keyless entry can be found through the lineup. Blind-spot and cross-path detection, active lane control, and adaptive cruise control are also offered. The 2019 Dodge Durango has a starting MSRP of $29,995 (plus destination fee). Standard warranty offers a 3-year/36,000-mile basic warranty, 5-year/60,000-mile powertrain warranty, and a 5-year/unlimited-mile rust-through warranty. Find Your 2019 Dodge Durango At University Dodge Today!